I’m sure it happens to everyone, but the past couple of weeks I got stuck in a food rut and a time crunch at work. In my line of business, it seems to ebb and flow – some weeks everything’s fine and smooth and others I’m underwater with the number of meetings, deliverables and deadlines. Yeah… that happened. So, the blog got a little behind. But I’m back now! 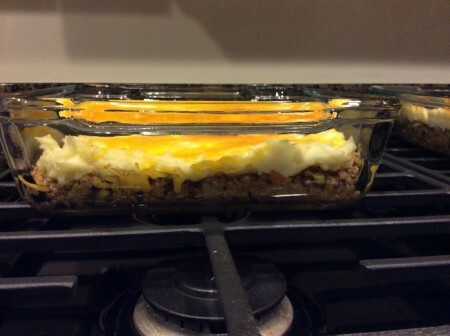 And I’ve got another great recipe to share: shepherd’s pie. This recipe comes courtesy of my boyfriend Sean, who grew up eating his mom’s shepherd pie in Trinidad and Tobago. It’s true that he’s third generation Trinidadian, but his family’s roots are from England originally. And as a true European, the traditional recipes like shepherd’s pie, chicken and dumplings and a few other tried and true favorites were integrated into his family’s repertoire along with more Caribbean dishes like stew pork, curry chicken and pelau. Don’t worry, I’ll get those recipes up here sometime sooner or later. 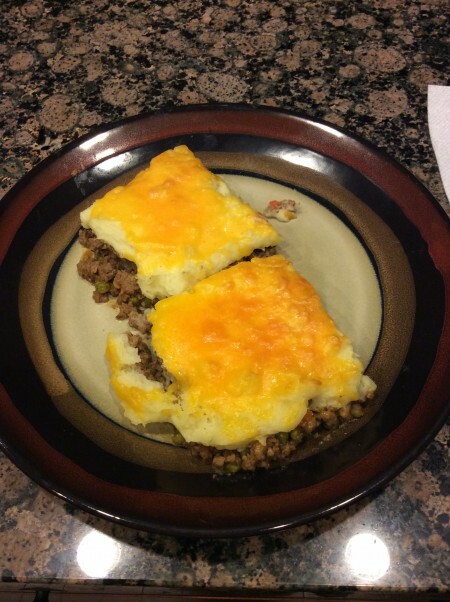 But today, I’m talking about the comfort food from the homeland: shepherd’s pie. It’s one that I didn’t grow up with, but with a combination of mashed potatoes, ground beef, peas, carrots and of course, cheese, how wrong could you possibly go? Not very. 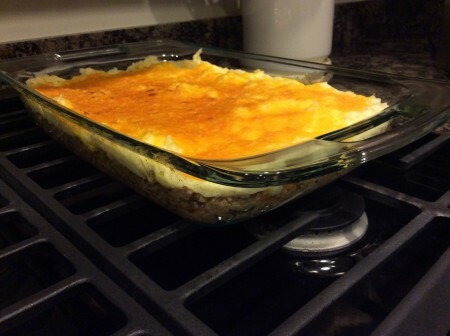 The last time his mom came to visit she whipped up a big helping of shepherd’s pie – we must have eaten it three or four times at least – and we took careful notes to be able to recreate it in the future. When it started to cool off for the fall, we finally had a good reason to pull the recipe back out and make some hearty, filling, comfort food. This shepherd’s pie lasts for days and reheats like a dream as well. Enjoy! Peel and thinly chop about 4 pounds of white potatoes. Place sliced potatoes in a skillet of water until just covered and boil until the water is boiled off. Halfway through the process add half stick of butter to melt in with the potatoes, the paprika, garlic powder and black pepper. While the potatoes are cooking, cook the ground beef in a skillet with the thyme, red pepper, minced garlic, creole seasoning, and Worcestershire sauce. Once meat is cooked through, add can of peas and carrots, flour and chicken broth and mix. This will make a good, thick sauce for the meat. After potatoes are cooked so the water’s cooked off, transfer them to a big bowl and mix with a hand mixer until smooth mashed potatoes are achieved. Spread beef mixture in the bottom of a large casserole dish. Layer the mashed potatoes over the top. Add shredded cheese on top and bake in an oven preheated to 350 degrees Fahrenheit. Once cheese is melted and mashed potatoes are browned, remove from oven, let cool 5 minutes and serve. Shepherd’s pie fresh out of the oven. Look at that golden brown crust. A perfect layer of ground beef and carrots beneath that layer of fluffy mashed potatoes and cheese. Would you like one slice or two of shepherd’s pie?